The Packers main focus this draft will be to patch the holes in it's defense. Here is a quick run down of my mock draft on the direction the Packers will go in this draft, which starts on ESPN tonight 8PM ET. 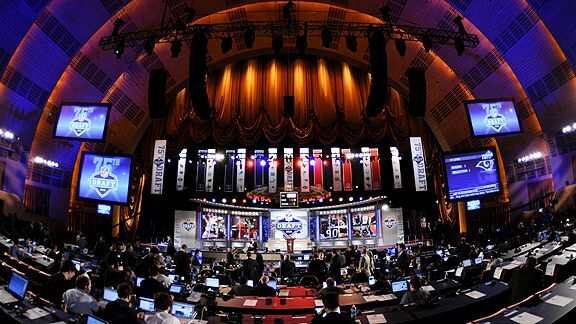 The 2012 Draft is set for the Packers to improve what they lacked on defense in 2011, as well as looking to the future. The Packers will get one of these two gentlemen. Don't be fooled by the word gentlemen, as these are big boys. Andre Branch, 6 foot 4 inches, weighs in at 260 pounds and Brandon Thompson, 6 foot 2 inches, weighs in at 314 pounds. Both men can play any position on the defensive line. Branch is the better pass rusher, but Thompson is the better defender against the run which are two big areas the Packers need to improve on. Charles Woodson, meet Ron Brooks. A lot of fans will not like the Packers taking him, for many reasons. One, Brooks will replace Woodson eventually. Two, he was never a starter at LSU. And you can't blame him. He was 3rd on the depth chart behind Patrick Peterson and Morris Claiborne. However, at the combine he was a top performer in the 40 yard dash (4.37 seconds) and vertical jump (38.0 inches). Finally, he's small. Only at 5 foot 10 inches, about 2 inches shorter then what a corner back should be. However, even with his height his speed and awareness will make him a star. Why not? Packers can't go into the season with just two quarterbacks. And, to benefit Russell, what better then to be under the wings of Aaron Rodgers and Tom Clements? John Gruden, and many others, consider Wilson to be a sleeper in this draft. Some comparing him to Drew Brees when Brees was said to be "too short", just like Wilson. Wilson already has a huge following in Wisconsin, coming from the Badgers. So, he has that going for him too. Jeff Saturday, the veteran, will be the starting center for the Packers in 2012. No questions asked. But, being at his age, Packers need to start grooming a new center after losing Scott Wells in the offseason. Saturday is great, but I have a feeling durability will be a question for him in 2012. Philip Blake offers Green Bay some insurance at the center position. With the release of Nick Collins, this pick makes a lot of sense. Thomas has played every game the last two seasons for Syracuse. Also, undersized, he still managed to rack in 85 tackles and 6 interceptions in 2011. Thomas is a competitive and active safety who is very physical in run support. He displays good foot speed in the open field when playing zone and can keep receivers off their routes with his physicality in man coverage. Very quick, fast, and agile. Is effective in man coverage, and can turn and run with most receivers. Decent in zone as well. Had a strong senior year, improving as the season unfolded. Smart, healthy, durable, and productive. Coty Sensabaugh was a football, basketball, and track star in high school. Sensabaugh broke into Clemson's secondary rotation as a redshirt Freshman in 2008. Sensabaugh looks like a track star, with a thin build, long arms, and high hips. During his senior season, Sensabaugh was given a lot of press man coverage assignments, and provided consistently tight coverage. Look for this to be the big sleeper pick the Packers salivate over. With Chad Clifton gone after failing his physical, Bryce Harris gives the Packers a great chance to replace Clifton with no ill effects. Harris comes in at 6 foot 6 inches, 300 pounds. He's taller then Chad, but 20 pounds lighter. Regardless, he will be a great asset in "Project: Keep Aaron Rodgers Healthy". Harris closed out his career starting in 39 consecutive games over the last three seasons. This will be a good late pick for the Packers. He's top 15 running backs available in the draft. As a junior in 2010 Gray rushed for 1,133 yards with 12 touchdowns and was an All-Big 12 honorable mention for the second consecutive season. Durability is a question for Gray, but overall a solid running back that will be available late. These last two picks will be the first steps in looking to replace the legend of Donald Driver. As a freshman in 2008, Childs played in 12 games with one start and had 18 receptions for 273 yards and two touchdowns. As a sophomore he started eight of 13 games and led the team with 48 receptions for 894 yards and seven touchdowns. As a junior in 2010, he played in eight games and had 46 receptions for 659 yards and six touchdowns before suffering a season ending patellar tendon injury. Durability, again, may be an issue. After redshirting during the 2006 season, White appeared in nine games for the Broncos. After missing the 2008 season due to injury, White finished the 2009 season with four 100-yard receiving games. 2010 was White's break out year. The Sports Illustrate Honorable Mention All American led the team in receiving yardage (1,378 total yards), as well as took over punt return duties for the Broncos. White was named to All-MAC First Team. White was given a sixth year of eligibility by the NCAA to return to Western Michigan due to his injuries during the 2008 season. In 2011 he led NCAA Division 1 in receptions (140), total yards (1,911), and yards per game (147.0). White finished with 4,187 yards, 306 receptions, and 32 touchdowns with Western Michigan.